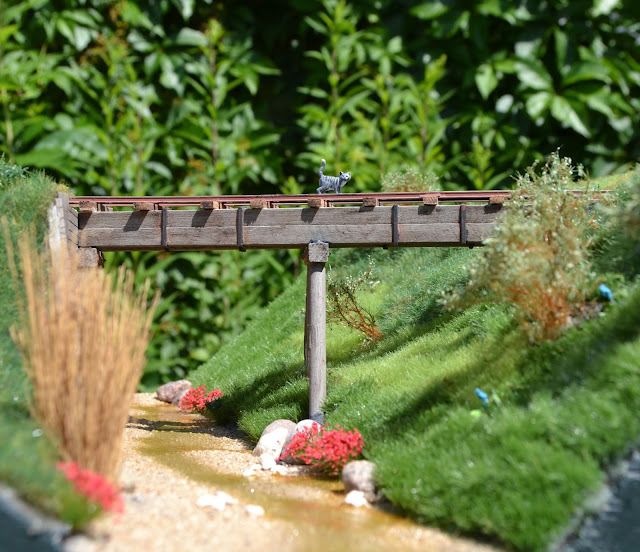 Although the Danish summer so far has been nice and warm, the little stream running under Nystrup Gravel's 600 mm. line has been filling with water during July. Not a lot, but enough to give the impression of a trickling stream during summer. A view along Little Stream from south. Having for too long considered what commercially available product to use for water in my little stream, I have finally taken the plunge. Having read of all kinds of trouble with several brands of model water and having witnessed other modellers' challenges I decided to simply use gloss varnish. I had a few small containers with left over Vallejo gloss varnish that I could use up on the project. The bridge over Little Stream seen from the north. The waste outlet on the right is from Banke's Bakelite. Water from the factory is let out untreated, which now and then cause a lot of dead fish down stream. I brushed on 8 rather thick layers of varnish over the gravel bed. As the varnish wasn't quite clear anymore (I think the varnish discolours over the years if not used) the dried 'water' took on a rather pleasing, slightly muddy look. I managed to apply 2-3 layers in an evening, leaving sufficient time for the varnish to dry before the next layer was applied. Originally I had intended the water to be somewhat deeper. Now I like the look of the almost dried out stream and besides, with thin layers of varnish deep water isn't really possible. Vallejo gloss varnish just brushed on has a whitish foggy look. It dries clear and gloss after a while. Dear Claus, you really should report to the local police about Banke's letting it's sewage run uncleared in your river. This is inadmissible behaviour of this company! Besides of this: wonderful modelling !!!! Weii, Ernst. It's in the beginning of the 1950's and protection of the environment wasn't as high on the agenda as it is today. Surely the neighbours wasn't too pleased but it wasn't a daily occurence so they learned to live with it. Thanks for the nice feedback. 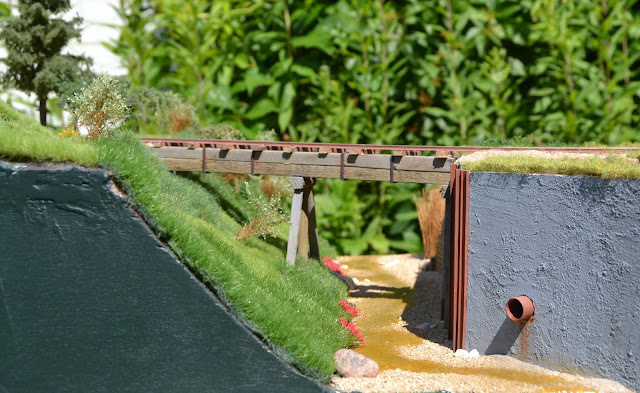 For 15 years Nystrup Gravel was in 1:35 scale on 16.5 mm gauge. In 2018 a scale conversion was initiated and is still in progress. 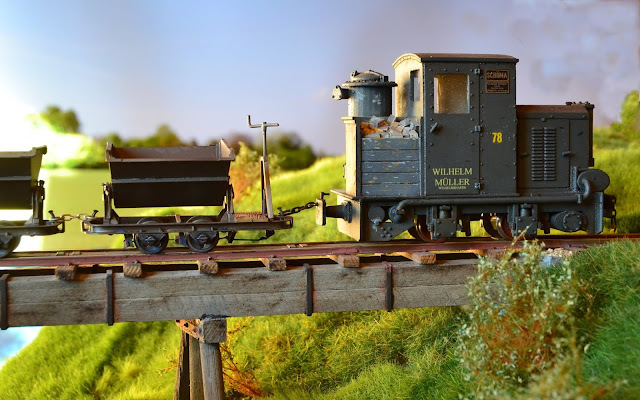 I model the company’s railway as it looked in the early fifties. I try to make up a believable setting for my railway models by researching the history of the company and its environments. This blog gives you the possibility to follow my work. Notice that Nystrup Gravel is fiction and that all history regarding the railway and company is my work and not real.